Well Hello all, or anyone at all?....who knows if anyone still checks into this space anymore. Well, to explain my long absence, I have been looking after and nurturing a very large belly filled with a very wriggly and blooming baby. Yes, I am 7 1/2 months pregnant and due to give us all a wonderful Christmas present this year. I have been frightened to write it here for so many reasons but I have come to the conclusion that it is something to rejoice in, celebrate and share with people who I know care a great deal and can send us as many well wishes and thoughts and prayers. I kept it quiet from as many people as possible until it was so obvious that I hadn't just been indulging on cake and fish and chips all Summer. The gallery fortunately just goes from strength to strength and was incredibly busy this Summer keeping me focused and occupied. I have one final commission to do pre baby and am starting to wind down. Its been a rollercoaster of emotions and a long long pregnancy but I can see the end in sight. Fear is my main enemy and positivity the one I need to be best friends with. We have been looked after and have a plan and I am as confident as any woman can be that I will be holding my beautiful baby by Christmas Day. It is quite poignant that my due date is exactly 1 year and 9 months after the birth of our little girl last year. We have brought that date forward slightly but still, it seems quite fated to me. I need and want to celebrate every single kick I get and every last day I have until they arrive. So for now that's all I feel I can say, I've come out of hiding and feel good about it. Eventhough you have been away, I have actually thought about you now and then over summer and autumn - wondering how you were doing. I definitely understand why you needed some time off. I can't tell you how much I appriciate the wonderful news about your Christmas baby. Oh WOw! I do check your blog! I'm so glad you blogged about this. That is lovely to hear your news, and I'll say a prayer for you. I look forward to hearing of more good news in December. Take it easy. Oh Janet - I am so happy to see this post from you!! Push fear away and focus on that wee wriggly babe - I honestly couldn't think of a better present for you two. Just a quick hello to send you all the best from Victoria, BC, Canada. It was a nice little surprise to see you in my Google Reader. Of course we are still here! Look forward to your next post and wishing the 3 of you all the very best. I had you in my reader all the time. It is so great to hear the news, I can imagine the turmoil of feelings: happiness, fear ... it makes my heart cringe thinking of all the different feelings. Looking forward to reading even better new pretty soon! Oh yes please keep blogging! So happy for you. Wonderful news. Well now Janet, how FABULOUS to find you back in your little patch of Blogland, I have sososososososo missed you! You are often in my thoughts (as you know), particularly this last week and I've found myself coming to your blog almost every day to see what's doing, I had a feeling you would be about....so happy you're back yaaaayyyy! Here's wishing you a joyous run up to christmas+baby time, I was just thinking that this time last yr I was getting veeeeeeeeeeery round myself as Billy was born 5th Jan, so know how you must be feeling....take it easy, take it slow, but my goodness, yes, celebrate what you have going on, it's going to be GREAt!!!!!!!!!!!!!!!!! Fantastic with a new blog my cousin. 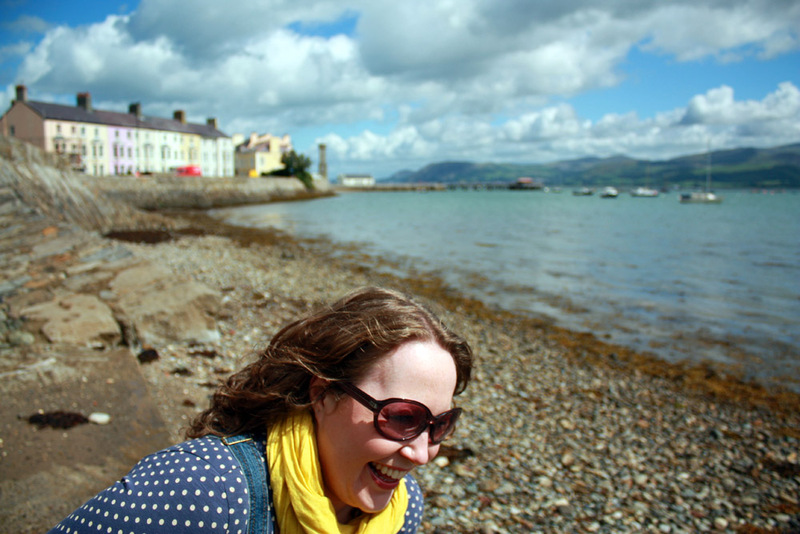 It sounds like everything is good in Beaumaris. I miss you - looking forward to see you again. Say hello to Sean & Anna. it fills me with joy to read your post. and see...how many people have been missing you!! enjoy the last weeks and be sure to enjoy restful cosy times because you are going to be so wonderfully busy very soon. and you are going to make a very beautiful and wonderful mummy! i'm so glad you put your fears aside to share such a special announcement here with folk who care. Janet, that is the nicest news, and so nice of you to share it here. I understand there must be alot of emotion for you but you just stay positive girl! I want to send you all my love, you are such a brave soul - take lots of good care of your dear self. Glad to hear that you are alright and awaiting your Christmas bump. I do keep checking in from time to time and glad to hear that the gallery is going strong too. Give this little baby a bathing suit or a sun hat one year for their birthday. I always wished for something summery! And birthday parties- I would suggest a 1/2 birthday party- June 25th! Those were always successful and fun for me! Oh Janet, I'm so delighted to hear this news of your soon to arrive baby! How wonderful! The Gallery was looking fantastic when we visited it in the summer, and it's lovely that you can now take a bit of time away from work to enjoy the baby bliss. Love to you and your hubby too. really pleased for you both! I think of you often and wonder how you are doing. I read your tweets and I'm far far behind on the old blog reading but was so pleased to read of your wonderful news.